Is the Islamic State (ISIS) in Bible prophecy? Here are some key prophecy passages that Islam fulfills. If Islam fulfills them, it is likely that the Islamic State (ISIS) fulfills them. Fulfillment is not negated by Islamic experts denying culpability for ISIS’s actions because they are not “Islamic“; or because ISIS has misinterpreted the Qur’an because they have taken passages literally (out of context). Fulfillment occurs when the Bible’s prophetic statements are no longer prophetic; that is, they are fulfilled by fact or history. We cannot determine fulfillment on the basis of the statement of a Muslim. The sword has historically been Islam’s signature, including key passages having the noted distinction of the “sword verses.” Ahmad bin Muhammad bin Hanbal, founder of the Hanbali School of Islamic Jurisprudence, and a renowned Sunni theologian, quotes a saying of Muhammad, “I was sent with a sword in my hands so that only God Almighty is worshiped without equal. He put my sustenance in the shadow of my spear, and disgraced and humiliated those who oppose my order.”1 Of course, it is not simply the sword that matters but what Islam does with the sword– Islam is as renowned for beheading as the Roman Empire was for crucifixion. Beheadings make a statement that goes far beyond an execution. Why did ISIS stick severed heads on pegs for the world to witness? To breed fear in its opponents (an ageless practice of Muhammad’s mujahideen2). Why did ISIS videotape the beheadings of the James Foley, Steven Sotloff, captured journalists, and British aid worker, David Haines? To stoke fear in the minds and hearts of all, both Muslim and non-Muslim. Of course, we must not get focused on a literal sword or beheadings as if it is the ultimate instrument of violence of the Islamic State. The beheadings only illustrate that the Islamic State will use whatever instrument of death it can get its hands on. Osama bin Laden insisted upon using oil as a sword, one that perhaps would cut the “head” off the western economies. But I suspect the real sword for ISIS would be a chemical or biological weapon; or even worse, a nuclear one. Islam is violent. That is a fact. Islam is divided, Sunnis against Shias (and Salafis-jihadists against everyone, of which ISIS is Salafi-Islamic). Daniel 2:41 NASB. They have been divided since 632 a.d., the year of Muhammad’s death. The dividing issue was the rightful successor to Muhammad, and therefore, the rightful source of spiritual guidance to Muhammad’s followers. The division came to permanence in the Battle of Karbala, 680 a.d., when the Sunni majority massacred the Shia minority, including Husayn, the sole surviving grandson of Muhammad. This division continues to the modern day, even to the point that many Sunnis consider Shias as apostates, incapable of receiving forgiveness of their sins. Read more. Read more. That is a fact. Sunnis do not “combine in the seed of men.” The Islamic State is a Sunni Salafi-jihadist sect. It does not fulfill this prophecy by point of fact. The branches of each sect within Islam “will not adhere to one another,” even as “iron does not combine with pottery.” Daniel 2:43 NASB. Islam has two divided sects, Sunni and Shia. Within each sect there are “branches” (much like the branches comprising a single tree). The branches are not united even within the sect. Unity is rare in Islam. The Islamic State and al-Qaeda, for example, are both Sunni Salafi-jihadi branches but neither supports the other’s efforts. At one time, ISIS vowed loyalty to Al-Qaeda. However, Abu Bakr al-Baghdadi refused to submit to the leadership of Al-Qaeda accusing al-Qaeda of not following the puritan model of Muhammad. Al-Baghdadi subsequently declared himself independent, not only al-Qaeda but also Jabhat al-Nusra Front of Syria, an Islamist branch that al-Baghdadi was once a part of. Even as this article is being written there are reports that the Islamic State and Jabhat al-Nusra have united against the Shia Alawites of President Bashar al-Assad of Syria.7 That is a fact. Islam blasphemes God and His Son. Daniel 7:25, Revelation 13:6. Islam considers Jesus to be a prophet and not the Son of God (Qur’an 3:47, 59, 64, 19:35). In this one Quranic revelation, Islam blasphemes the Father and the Son. 1 John 2:22-23; 1 John 4:3. The Scripture says that whomever does not believe what God says about His Son makes God a liar. To make God a liar is to commit a blasphemy against God! 1 John 5:10. Islam does this. That is a fact. Islam has a “strong and a weak (brittle) sect.” Daniel 2:42. Islam has historically been composed of a strong and a weak sect. Shias are the weak sect. Shias are actually considered unbelievers by most Sunnis, particularly Sunni Salafi Muslims, and are apostates incapable of repentance for forgiveness of sins. Islam is a “different” kingdom. Daniel 7:7, Daniel 7:19, Daniel 7:23. “Different” is defined in comparison to Babylon, Media-Persia, and Greece, all nations with geographical boundaries and political/military leaders and kingdoms (Daniel 7:1-6; Daniel 7:7). Islam is not a nation, nor a country with geographical boundaries but a religion whose boundaries are determined by the numbers of its adherents. There are 1.6 billion Muslims in the world today. The boundary of Islam is defined by its adherents not its political dimensions or allegiances. In Islam, religion extends through all areas of society, including politics. The governing law is not a constitution but the Qur’an and Hadith, Islam’s sacred writings, referred to as Sharia law. Hence, Islam is not advanced in the name of a king but in the name of its god, Allah, and has dominion through the presence of its adherents and their submission to Sharia law. Islam is different. It is not a political kingdom but a religious kingdom with political dimensions. That is a fact. Islam’s beginnings include “three horns being plucked up by the roots.” In Islam’s origins, the first three caliphs (“horns”) were “uprooted” when they were usurped by Shias. Daniel 7:8. Islam specifically fulfills this passage in its formative years. After Muhammad’s unexpected death in 632 AD, Muhammad’s followers could not agree on who should be the next caliph. Shias believed the next caliph should be related to Muhammad by blood. Sunnis believed Muhammad’s successors should be chosen without regard to blood, but based on who was best able to lead the “umma,” the community of Muslims. Sunnis prevailed and the first four caliphs were chosen without regard to blood-line to Muhammad. Ali, Muhammad’s son-in-law and cousin, was the closest blood relative to Muhammad. Ali was ultimately chosen as the 4th caliph after being passed over three times. Shias rebelled against the Sunni choices of the first three caliphs because they considered them illegitimate by lack of blood relationship to Muhammad. They retroactively made Ali the first legitimate successor (“Imam”) to Muhammad thereby effectively ignoring the first three caliphs as if they were never designated as caliphs by the Companions. Shias consider Ali to be infallible and sinless by virtue of his bloodline and divine appointment by Allah.8 Shia Islam fulfills this prophecy by point of fact. Daniel 11:42-45 (NASB) “Then he will stretch out his hand against other countries, and the land of Egypt will not escape. 43 “But he will gain control over the hidden treasures of gold and silver and over all the precious things of Egypt; and Libyans and Ethiopians will follow at his heels. 44 “But rumors from the East and from the North will disturb him, and he will go forth with great wrath to destroy and annihilate many. 45 “He will pitch the tents of his royal pavilion between the seas and the beautiful Holy Mountain; yet he will come to his end, and no one will help him. “Rumors from the east and from the North will disturb him… yet he will come to his end, and no one will help him.” Interesting isn’t it. Whomever the king of Daniel 11:36-45 is, he will be defeated. Who are those from the east? Iran is from the east. It is Shiah. Who is from the north? Russia is from the north. They are both in the nations of Ezekiel 38 that launch their attack against Israel. The one “whom no one will help”? I suggest it will be ISIS. ISIS is in Bible prophecy; as defeated. But who will replace them? Israel will be attacked from the east and from the north. Actually, there are not that many candidates. 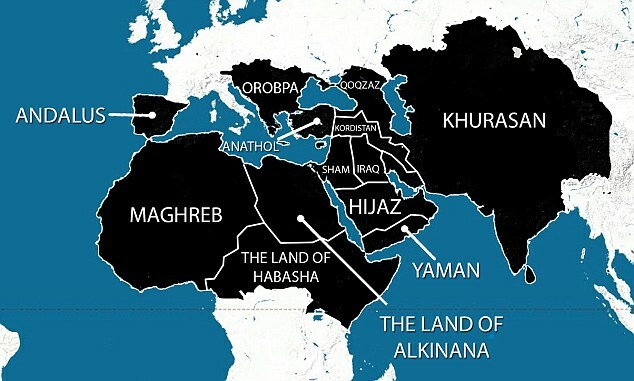 A Revived Khilafah – Does the Scripture Foretell ISIS as the Revived Empire? On the horns of a dilemma – How will Obama not have to decide? Why did ISIS stick severed heads on pegs for the world to witness? To breed fear in the populations of america, england and france so that those countries could more readily go to war in the mid east and topple assad from syria. have you noticed ISIS suddenly has fighter jets and pilots under training? that will help NATO/US/Neo cons to get a no-fly zone in syria. the end game/target is iran. its been planned for years/decades.